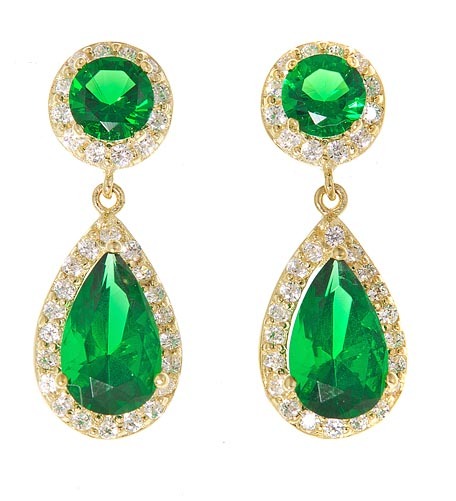 The Dutchess 1.5 Carat Pear Lab Created Emerald Pave Cubic Zirconia Halo Drop Earrings feature a half carat round top with a 1.5 carat pear drop. 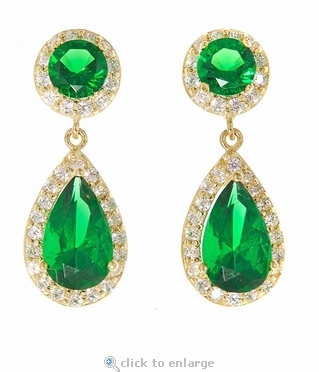 Each laboratory grown man made emerald green gemstone is surrounded by a halo of pave set cubic zirconia rounds. The earrings measure slightly under one inch in length. The earring drops are available in your choice of 14k yellow gold. These earrings come with standard push backs and large backs are available as an upgrade. Please see the pull down menu for options. For further assistance, please contact us directly at 1-866-942-6663 or visit us via live chat and speak with a knowledgeable representative.